For most people meals are a social event. 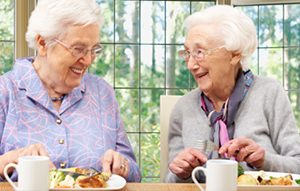 Senior Moments has considered this in developing our meal plans and cafe like environment. We welcome you to Millie’s diner. A cafe theme that is relaxed and socially enjoyable. All meals are low in salt and fat. Meals are developed to meet the health needs of the participant.